No man is ever likely to emulate John Surtees' feat of winning World Championships on two wheels and four. 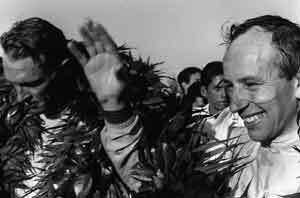 Surtees' prowess on motorcycles won him universal respect, and soon after trying out cars for Vanwall and Aston Martin in 1959, he switched full-time to cars in 1960. A victory in Formula 500 for Ken Tyrrell at Goodwood confirmed the wisdom of the move, and he made his F1 debut for Lotus in Monte Carlo. One race later, he finished second at Silverstone in the British GP, before taking pole position in Portugal. Despite the prodigious speed he showed, this was the point at which Colin Chapman was forging his deep alliance with Jim Clark, and Surtees elected to move to pastures new just as the British team really began to establish itself. After winning the World Championship for Ferrari in a dramatic Mexican Grand Prix in 1964, Surtees quit the Prancing Horse in the middle of the 1966 season after internal pressure became intolerable, and thus left Jack Brabham a clear run to the title. After a dismal 1969 season he left BRM to set up his own team, Surtees Racing Organisation, for 1970, just as BRM started winning again. In a car, as on a bike, Surtees was a fearless, tough but fair competitor, as quick as the best without being wild. But where most of his rivals contented themselves with riding or driving, he had a deep interest in the workings of his machines. Some said he should have simply concentrated solely on racing, itself difficult enough, but he liked to tinker and probe in an unceasing quest for technical perfection. Surtees has few regrets, however. Such an approach worked perfectly well as his exploits on motorcycles passed into legend and he took MV Agusta to countless victories and the World Championships in 1956 (500cc class), 1958, '59 and '60 (350 and 500). In that final year he also began the car racing career that would take him to the unique double by the age of 30. A year after his four-wheel World Championship he was badly injured when his CanAm Lola T70 crashed at Mosport Park in Canada. It was a mark of the man that he astonished doctors with the speed of his recovery. Resilience and determination were always Big John's hallmarks in a career that deserved even greater success.